Today’s interview features two sisters who maintain a creative blog and published an adult coloring book – fostering a creative outlet for themselves as well as others! In my introduction to meditation post (read it here) I listed a number of forms meditation can take. 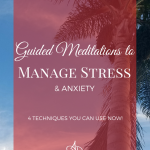 There are many ways to meditate for all kinds of benefits from stress relief to increased mental acuity, to greater compassion. Meditation doesn’t have to involve sitting on a pillow and chanting (unless you want it to!). I’ve meditated through dance, making Christmas cards, and even cleaning my bathroom! Today I’m pleased to share another path to meditation for mental and emotional wellness through coloring! Sharon and Teresa are two creative sisters who published an adult coloring book. If you’re at all familiar with the adult coloring book craze – you know there’s a reason they’re so popular! Coloring is scientifically proven to have all kinds of benefits (which isn’t surprising considering it’s a meditative practice!). Check out the inspiration for their coloring book in the interview below (and then take a look at their blog for more coloring meditation!). Note: This post may contain some Amazon affiliate picture links. When you make a purchase through those links, Sharon and Teresa retain their normal royalties for any book purchases, and I receive a small commission for the referral with no additional cost to you! It’s a win-win-win! We are a two-woman team, Sharon (Ronni) is an IT professional, dog lover, closet silversmith, enthusiastic DIYer and lover of all things creative. Teresa is an accounting and finance professional, lifestyle fanatic, closet crafter, and consummate foodie. We are on a journey to find a creative outlet that will also support our life. We write a small creative blog where we share DIY projects, cooking, all things home, entertaining, adult coloring books, and making jewelry. When and why did you start illustrating? Ronni has been drawing all her life. She constantly doodles and this is how the book began. Teresa, is an amazing colorist, she has taken a shine to the adult coloring trend and really enjoys the process. Teresa is responsible for the inspirational sayings in the books as well as the cover. You both have a lot of creative outlets. Is this something you need? What do your creative outlets do for you on a day to day basis? Our quest is probably familiar to most of your readers. Both Teresa and Ronni (the Creative Life Studio creative team) work in the corporate world and were yearning for a more balanced lifestyle and were looking for a creative way to manage their stress levels. Participating in DIY projects, needlework, metalsmithing and drawing were some of the outlets we used to exercise our creative muscles and to help alleviate the stress in our lives. Why did you choose to create this book? Ronni draws as a creative outlet to manage stress during the long hours spent each day in corporate meetings and was frequently asked for the doodles she drew so they could be colored. We thought, why not use the results of our stress relief exercise to help others relieve stress as well! The resulting drawings were the foundation for Creative Life Studio’s first adult coloring book, Be Inspired Volume 1 Adult Coloring Book for Stress Relief. The team collaborated and came up with the idea to add inspirational messages to some of our images as a method inspire others to live a more authentic and creative life. If there is one thing you’d want for people using this book, what would it be? Enjoy the creative process you receive from coloring and let your creative energy provide you with relief from daily cares! You have a second book coming out soon. Can you tell us a little about it? Our newest book, Be Inspired: Volume Mini Adult Coloring Book for Stress Relief, features the original images in Volume 1 plus some new images that were inspired and created after the original publication. With Be Inspired Volume 2, we wanted to provide a product that would be perfect for travel. The book is 5.5” x 8.5” and is the optimal size for people who travel and want to take their coloring supplies with them. Also, included is a sneak peak of our third book, Be Inspired: Volume 3 Mandalas which is our first foray into the creation of the images used by many as a focal point for meditation. What is the best way to connect with you online? Readers can find us on our website, get a copy of our book on Amazon (you can also click the cover image above to purchase! ), as well as follow us on Facebook, Instagram, and Pinterest! If you want a creative outlet that easily doubles as a meditation – adult coloring books are for you! It’s a great way to unwind at the end of the day, or even in the middle when you need a break to recharge! Grab a copy of Sharon and Teresa’s book and a pack of pencils or markers! This is a GREAT way to show yourself some love! If you want more tailored meditation suggestions or practices, contact me to schedule a complimentary no obligation coaching session – I’m happy to help you find something that works for you! Contact me here!